The US chief of military operations in Iraq has admitted that attacks against American troops in the country bear the hallmarks of a "classic guerrilla-type campaign". His comments - on a day that saw one soldier killed and a missile fired at a US cargo plane - represent a remarkable acknowledgement, the BBC's Nick Childs at the Pentagon says. Pentagon officials have been reluctant until now to admit to a guerrilla campaign, describing the attacks as uncoordinated violence by remnants of the Baathist regime. "I think describing it as guerrilla tactics is a proper way to describe it in strictly military terms," US Central Command head General John Abizaid said at the first briefing in his new job. "It's low intensity but it's war however you describe it." General Abizaid's comments came as US soldiers posted in Iraq spoke out in the media expressing frustration and fear about the growing number of attacks on US targets. Public anxiety about events on the ground in Iraq is growing in the US and beginning to present real political problems for the Bush administration, our correspondent says. At least three other US soldiers were wounded in separate attacks in Baghdad. Correspondents say US forces in Iraq are becoming increasingly nervous and desperate to return home. One soldier at the scene of Wednesday's convoy blast wept and another raked the ground with machine gun fire. "We need more protection. We've seen enough. We've stayed in Iraq long enough," one soldier travelling in the convoy said. And in interviews with American television network ABC, other US servicemen in Iraq expressed their unhappiness. "If Defence Secretary Donald Rumsfeld was here, I'd ask him for his resignation," said a member of the 3rd Infantry Division based in the flashpoint town Falluja, west of Baghdad. "I don't have any clue as to why we are still in Iraq," said another. There is growing anger in the United States about delays in bringing troops home - particularly from the 3rd Infantry Division which helped conquer Baghdad. Their return has been delayed four times. General Abizaid said they would be returning in September, but added their homecoming was conditional on replacements being ready. The BBC's Peter Greste says Iraqis working with Americans are also becoming increasingly frightened about the risk to their own lives. He says translators are worried about reprisals from the militias. General Abizaid said that US military commanders had expected attacks on US forces to increase throughout July because of the number of public holidays associated with the former Baathist regime that fall within the period. Have Your Say: Crisis in US morale? He described the current resistance as coming from mid-level Baath party members and security forces and former soldiers from Iraq's Republican Guard in addition to "significant terrorist groups". He said they appeared to be organised in cells of six to eight people and were receiving financial assistance from regional level leaders of the former Baathist regime. "We take casualties and we cause casualties because we are at war," he said. 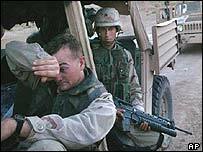 More than 30 US troops have been killed as a result of hostile action since US President George W Bush declared major combat over on 1 May. Since then the US has increased its forces to 148,000 while the UK contribution has dropped to 11,000. Senator John Kerry of the opposition Democratic Party in the US, a presidential hopeful, said the Bush administration should move quickly to bring other countries into the post-war effort to take the focus off American troops. "The obligation of the United States Government and the president is to rapidly internationalise the effort in Iraq, get the target off of American troops, bring other people, particularly Muslim-speaking and Arabic-speaking Muslim troops, into the region," he told CNN. The White House played down suggestions of falling morale among US troops in Iraq. "The troops recognise that what they are doing is very important - helping secure and stabilise Iraq so that it can move towards freedom and democracy," said Scott McClellan, chief spokesman for US President George W Bush. "The target was a soft one"